Mexican Fried Ice Cream, who couldn’t love that? Made with a crunchy, sweet, buttery outer layer and a sweet, creamy, cinnamon, ice cream center…. It has become one of our favorite ice cream treats! 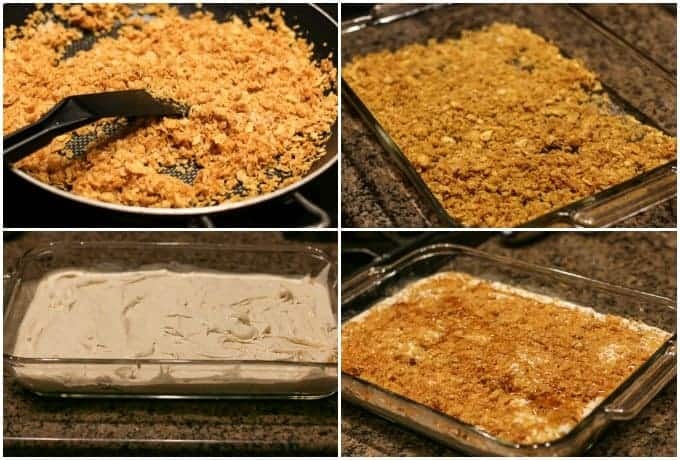 When I have a bunch of kids coming over, I make this Fried Ice Cream. I know that I become the “cool” mom for serving this to them. They practically drool over the stuff. They have no idea how easy it is to make and they think it is the greatest dessert ever… Could be because it is…. I tried Fried Ice Cream for the first time at our favorite Mexican Restaurant when I was pregnant with my daughter. I became hooked. I literally would go to eat there and order only dessert. If I had room for anything else, then I would order a meal…. My cravings were out of control. Could be why my daughter has such a sweet tooth???? Either way, I had to figure out how to make it myself. After some research and playing around with the recipe, I have come up with a pretty darn good version if I do say so myself. First you pan fry crushed cornflakes in butter and sugar until crispy. Next you spread half of corn flakes in a 9×13 baking dish. You mix ice cream, cool whip, and cinnamon together and spread it over the cornflakes. Then you add the remaining layer of cornflakes and drizzle it with honey….. INCREDIBLE!!! YES! You freeze it for 5 hours or overnight. It is great by itself or you can garnish it with your favorite ice cream toppings. Easy, right? Give it a try. You will make some folks pretty HAPPY!!!! 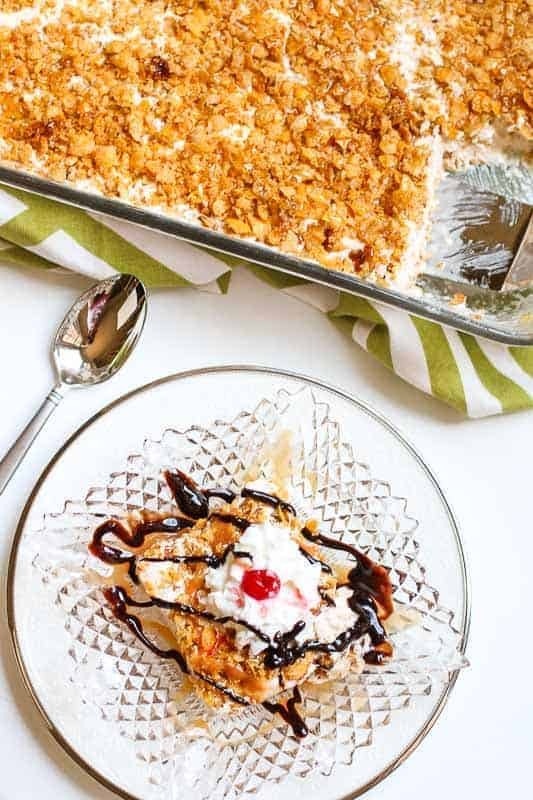 If you like this Mexican fried ice cream recipe, you will also enjoy: Strawberry Cream Shortcake, Easy Southern Banana Pudding, and Ooey, Gooey Butter Bars . 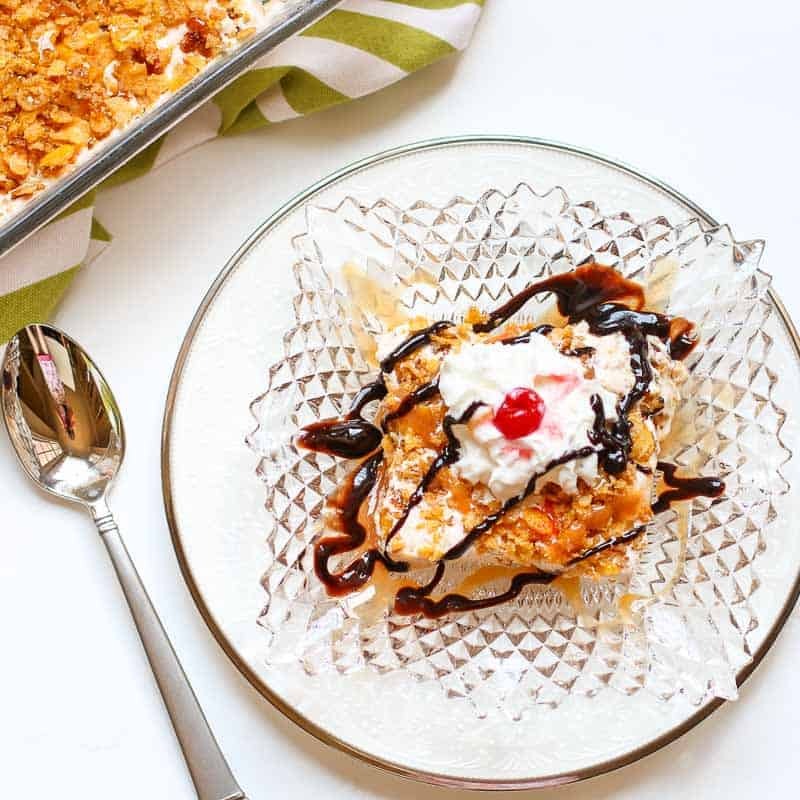 Who wouldn't love this Mexican fried ice cream recipe with cornflakes? It's made with a crunchy, buttery outer layer and a sweet, cinnamon, ice cream center. It has become a favorite of mine! Set container of ice cream out to lightly soften. Meanwhile, melt butter in frying pan over medium heat. Add crushed cornflakes and sugar, mixing and stirring continuously. Be careful not to burn. Cook until crispy. Spread half of cornflakes on 9x13 baking dish. Mix ice cream, cool whip, and cinnamon. 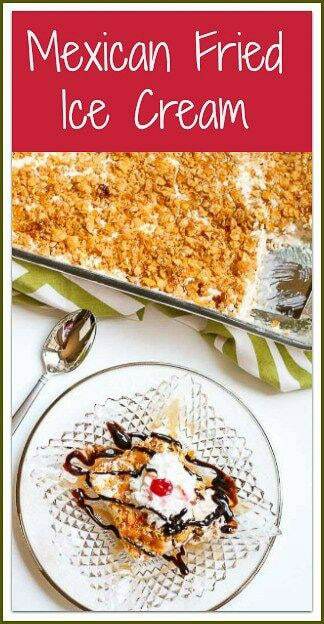 Spread ice cream mixture over cornflakes. Spread remaining cornflakes over ice cream. Cover pan and freeze 5 hour or overnight. *Optional: Garnish by drizzling chocolate and caramel syrup. Top with whipped cream and a cherry. 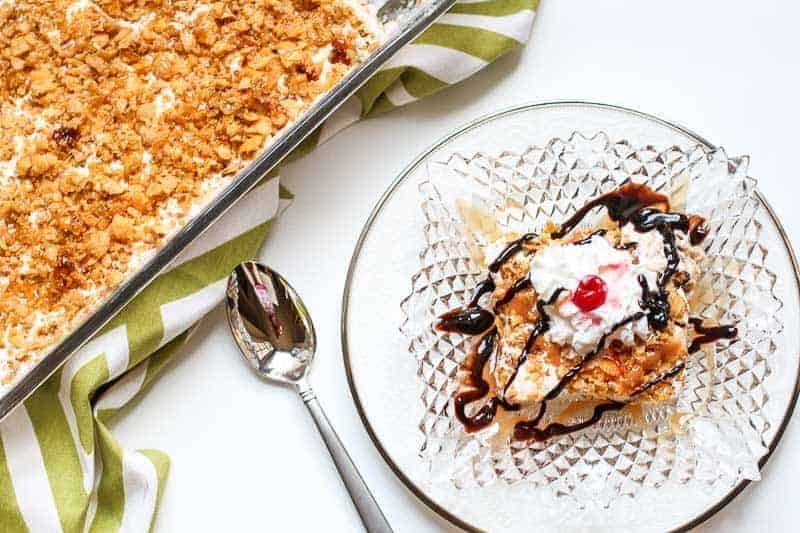 I’m making a fried ice cream for a client this afternoon… Is it wrong for me to confess I would rather be making yours instead 😮 This looks and sounds delicious the cornflakes are an ingenious addition! I can understand why this became a favorite, looks like a fun treat. This is an absolutely delish recipe. I will definitely make it, the kids will be over the moon. Thank you for sharing ?? Oh my! I love Mexican fried ice cream and this recipe look so perfect. Can’t wait to try it. Yum! I love this. We only eat fried ice cream on someone’s birthday if we celebrate at a Mexican restaurant. That doesn’t happen very often. I think the hardest part about this ice cream would be waiting at least 5 hours for it to harden! I would love to see a low carb version of this!!!! I would definitely try it Kim. Let me know when you do! It’s funny, Kaite, I have been thinking about offering my readers a low carb version of fried ice cream. I love how you have yours in a casserole pan! And your recipe is much safer since it is not actually fried. I think this is genus! This looks so good. I am gaining weight just reading this post. I so have to try this recipe. I make a ton of Mexican dishes and this would be the perfect ending to the dinner. I love this!! I always see fried ice cream on Mexican restaurant menus and wonder what it actually is. 🙂 I am totally making a mini batch of this when I get down to the bottom of my current bag of cereal. Pinned! Love that you pan-fried the topping so you don’t have to fry a whole ball of ice cream! Such a great way to curb a craving with half the work. Beautiful photos too! This looks delicious and unreal how easy it is! Perfect for me and all the warm sunny days ahead. I can certainly imagine the smell of the cornflakes in the butter. Yum! Imagine bottling that scent? Pinning 🙂 Have a great week, girl! This looks CRAZY GOOD Katie!! I`m not typically a huge sweets guy but ice cream is my downfall! I`m going to have to give this one a try! Pretty sure my kids will think I`m the ¨cool dad¨. Thanks as always for the great recipe!